Chemical treatment of water is often an essential factor in the use of water for industrial processes such as the operation of heating and cooling systems, steam boilers, and in numerous production steps in the steel industry, chemical industry and processing companies. 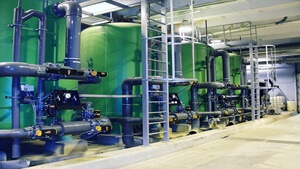 By using inhibitors and biocides, damage caused by corrosion, deposits and biological contamination can be avoided, thus ensuring the reliable and continuous operation of water systems. By extending operating time and minimizing maintenance work, considerable cost savings can easily be achieved. We can also deliver according to your specific needs. Learn more about Ochsmann Chemie’s custom production!